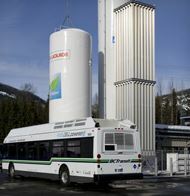 The US National Renewable Energy Lab, NREL released a second report on the fuel cel buses that were running until recently in British Columbia’s bus services in Whistler. The report indicates key achievements in significant CO2 reduction (almost 6000 tons) over the 3 year duration of the demonstration. Challenges remain bus availability (average around 71%) due to component supply and maintenance time. The FCEBs accumulated more than 4 million kilometers (2.485 million miles) in revenue service over the 4-year demonstration and more than 201,000 fuel cell hours, operating up to 22 hours a day in temperatures ranging from -20°C to 34.7°C (-4°F to 94.5°F). By operating the FCEBs, the agency has avoided emitting more than 5,835 tonnes of CO2 compared to operating diesel buses. The hydrogen station developed by Air Liquide operated reliably with very few issues, none of which resulted in downtime for the buses. The station dispensed more than 591,594 kilograms of fuel over 23,671 fills without a safety incident.